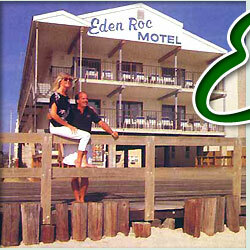 The Eden Roc invites you to relax and enjoy Ocean City, Maryland. We offer comfortable oceanfront and non-oceanfront accommodations and gracious service at prices to fit the vacationer's budget. We are located in the heart of Ocean City's resort area with a host of activities, shopping, dining and golf just minutes away. Step out of our door and onto the world famous Boardwalk for a fantastic time for the entire family. This site is designed and maintained by D3 Corp.